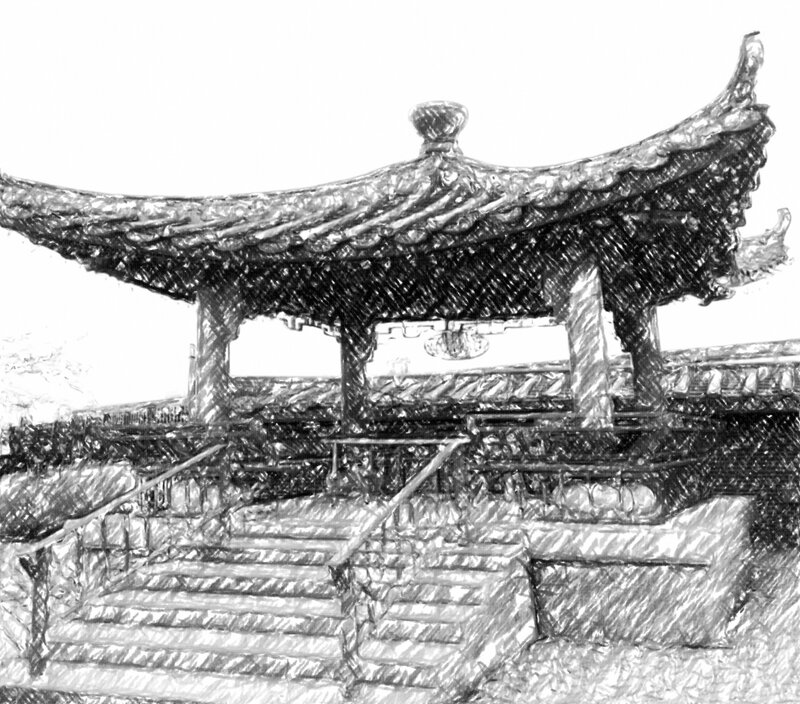 We wrap up 2018 in PopCult with a pencil drawing based on the decorative pagoda near the entrance to Chinatown in Chicago. This started life as a real-world pencil sketch based on a photo I was looking at on my phone. When I finished, I realized that I have yet to reconnect my printer/scanner after last February’s move to a new computer, so the sketch was photographed, and after I looked at the photo of the sketch, I did a little more digital tweaking, losing a few smudges and elminating glare along the way. I’m pretty happy with the way it turned out, since I’m still sort of teaching myself how to use my hands again. As usual, you can click the image to see it bigger. Also, in case you missed it, yesterday I posted a Brand-New episode of the Radio Free Charleston video show. You can see it and read about it HERE, or just scroll down one post on the main PopCult page. It was only one post ago. In honor of the new RFC, we are going to present a 24-hour marathon of Radio Free Charleston on radio…on The AIR, beginning Monday at 7 AM, and wrapping up Tuesday morning. Next week we are going to do a major reset of the schedule of The AIR, so this will be the final 24 hour Monday Marathon. We’ll tell you all about that in the coming days. Just like we did last year, the final Sunday Evening Video of the year sees the debut of a BRAND-NEW video episode of Radio Free Charleston! Also just like last year, it’s the only one we did this year. You PopCulteer and humble host still hasn’t quite gotten the hang of shooting music video while taking loads of medicines for Myasthenia Gravis. 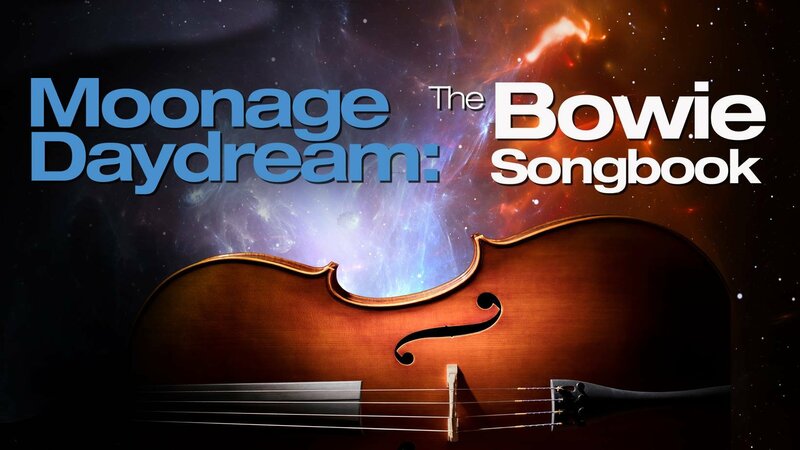 However, things are looking up, as two of the songs in this show were recorded within the last four weeks. 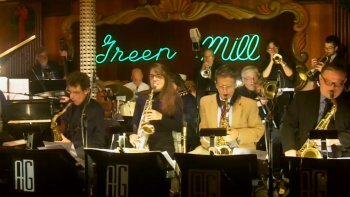 This episode of the show, “Chess Records Shirt,” features music from Brooke Brown, The Velvet Brothers and, from Chicago, Alan Gresik and The Swing Shift Orchestra. We also have what I believe is the last bit of animation from the late Third Mind Incarnation, and a new dancing Batman, courtesy of Frank Panucci. Brooke Brown is an old friend and former Gazzblogger who has become a formidable singer/songwriter. We caught up to Brooke just a couple of weeks ago at Gonzoburger, and both Brooke and Gonzoburger make their RFC debut, coincidentally on a show that is being posted on Brooke’s birthday! Brooke treats us to a clever original tune called “Asking For A Friend,” and we hope to hear more from Brooke on future shows, and on the RFC radio show on The AIR. Brooke has been performing regularly at Gonzoburger on Thursday nights, and you can check their Facebook page to see if that continues. You never know when Mrs. PopCulteer, Mel Larch, might jump and and join in on a song or two. Our animation is “We Takin’ Applications,” which is the final bit of work we have left from Third Mind Incarnation, the chief creative force of which contibuted to our early shows, then feuded with us and made us cut out his cartoons, then fell ill and on his deathbed gave us permission to restore his old “Pentagram Flowerbox” cartoons to RFC, and to also use his other short films on the show. Then, as he asked me to say, he croaked. 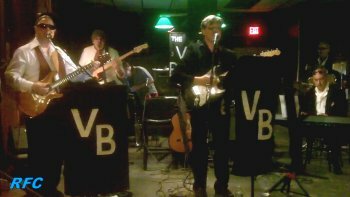 The Velvet Brothers are national treasures who operate on a local level. Jim, Greg, Bryan, Al, Craig, Dave and I’m probably forgetting a few are master musicians who specialize in the art of lounge music. They are the epitome of cool, and back in 2017 Mel and I caught them at The Cantina in Kanawha City, and posted a few songs online, outside of the context of Radio Free Charleston. Playing us out this week is a rarity for RFC. It’s a band with absolutely no ties to Charleston. Earlier this month your humble host and his wife made a trip to Chicago and visited the legendary Green Mill nightclub. We chose to go on Thursday night because that’s the night that they have Swing Music. If you read PopCult regularly, or listen to The AIR, you know that, in addition to being a huge advocate for all types of local music, yours truly is a major fan of Swing Music. Charleston does not currently have any Swing bands, and I don’t see much chance of one forming any time soon (but if they do, I’ll be there), so to get a chance to hear a top-notch Swing band cut loose, we went to The Windy City. Besides, in Chicago this IS a local band, so there. Alan Gresik and his crew put on an amazing show, and if we lived there, we’d go every week. They present the evening as if it’s a live radio broadcast from years gone by, complete with commercials and special announcements. The night we saw them they had a rotating crew of four or five singers and a tight and remarkably well-rehearsed 12-piece band. Of course, I’m always armed with my trusty Kodak Zi8, and managed to capture a song or two before the dancers overwhelmed my view. We bring you “Drummin’ Man” to close out this episode of RFC. 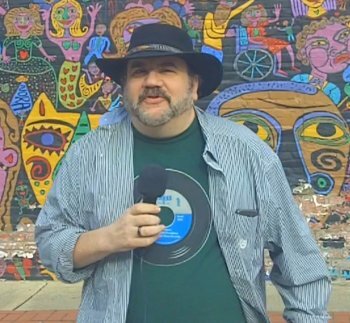 Chances are, we’ll do at least two or three times as many episodes of the show next year, but for now, I didn’t want to go a calendar year without bringing you at least one new edition of Radio Free Charleston‘s video show. Our host segments were recorded on December 30, 2018, the same day this post goes live, on Charleston’s West Side and in front of The Clay Center, after we discovered that it was “race your cars without a muffler down Washingto Street” day. Our title shirt comes from Willie Dixon’s Blues Heaven Foundation. Remember, you can catch the radio version of the show all the time on The AIR. This week we travel back to July, 2012 for a show that featured music from Mother Nang, recorded at Haddad Riverfront Park, and two numbers from the Charleston Light Opera Guild production of Legally Blonde. This episode was called “Fighting English Shirt,” named after my T-shirt, which was a mash-up of The Black Knight from Monty Python and the Holy Grail, and the logo for Notre Dame’s sportsball team. 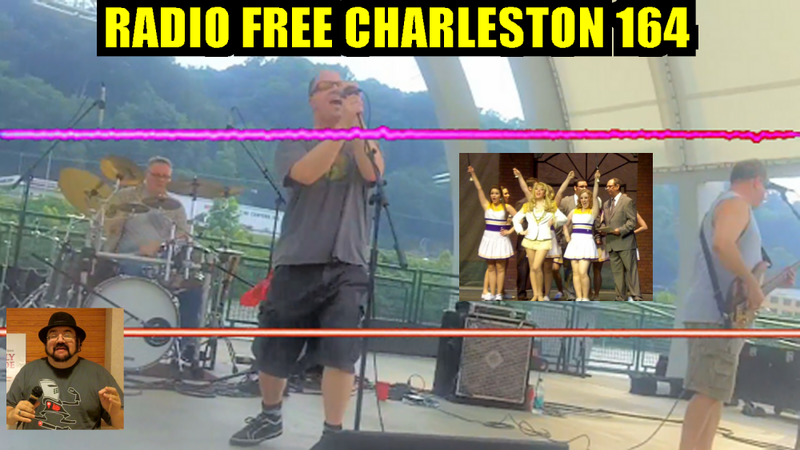 With this week we rejoin our chronological presentation of Radio Free Charleston. Host segments were shot at the Charleston Civic Center, which just goes to show you what might happen if you leave your podium just sitting around. This episode of the show also features the song “Buying The Farm” by Mother Nang, recorded in the summer of 2011 at Haddad Riverfront Park. Mother Nang is a legendary band on the Charleston Scene, and the various members are all still active, musically, whether together or apart. We also have animation this week, but I’m still not allowed to talk about it. 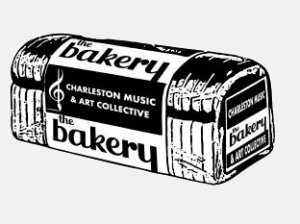 PopCult has been covering it for over a year and a half, but New Year’s Eve sees the official grand opening of The Bakery, Charleston’s newest all-ages music venue, located at 1007 Bigley Avenue (the old Purity Made Bread Factory). Long months of work by volunteers, raising funds, painting, doing construction and bringing the building up to code have paid off. Monday evening, beginning at 6:30 PM, a FREE show kicks off the new, completely-approved by Charleston’s Fire Inspector and compliant with ADA and all other regulations, music venue. The Bakery is finally here, and it’s completely legal. There are four bands scheduled for Monday with more expected to be added later. As of now the line up is Saprogen, Everpulse, Luna Park and The High Incident Project. This is a free, all-ages show, intended to introduce Charleston’s much-needed new all-ages venue to the public. Think of this opening night as a harder-rocking alternative to Charleston’s Good Night performances. Charleston has needed an all-ages venue for quite some time, and it’s great to see the group behind The Bakery overcome the various and formidable obstacles that have caused this project to have such a prolonged gestation. Here’s to the perseverance of those who worked so hard to make this happen. This ia great chance to get out and enjoy some of Charleston’s most talented performers in intimate settings without spending any money on tickets. 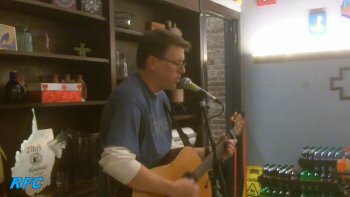 It’s a way to support the local scene and be a cheapskate at the same time, and with The Bakery grand opening at the same time, music lovers can choose from Hard Rock, folk music, Celtic music, classic rock, choral music, Barbershop, world music, gospel, old-time traditional, classical and more. 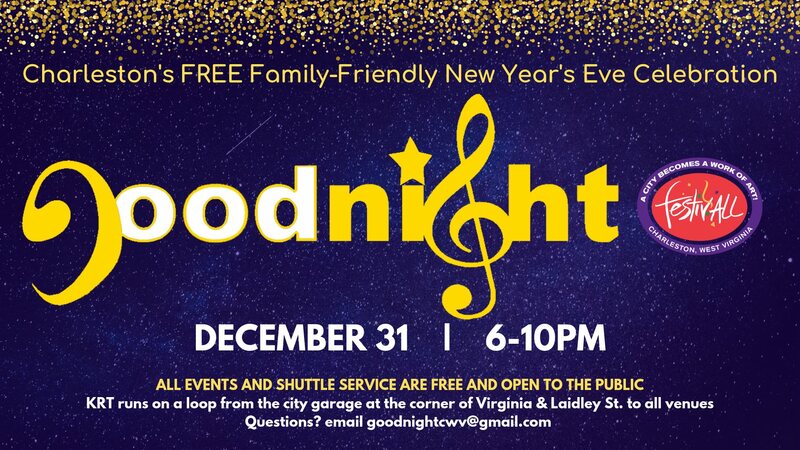 Good Night is a wonderful Charleston tradition, every New Year’s Eve, from 6 PM to 10 PM, presenting free music all around town. It’s a great way to ring in the new year and get a head start on forgetting the one we’re about to kick to the curb. And that’s it for this year-end edition of The PopCulteer. Check back for our regular features, and also look for some kind of surprise before the end of the year, if I can force myself out of my post-holiday slacking mode. Having Christmas and then New Year’s hit right in the middle of the week has thrown your PopCulteer off his usual work-a-holic methods, and going back to work is taking more effort than normal. Still, I’ll soldier through this bout of relaxation…for the kids! 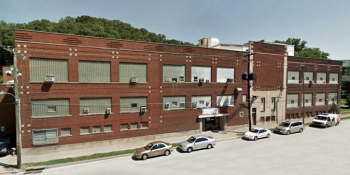 One of the biggest toy industry stories of the latter half of the year broke last week, and it took four days before anybody noticed, and didn’t hit the hobby press until two days after that. 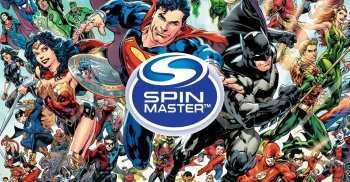 DC Comics has signed a three-year deal with Spin Master to make action figures and other toys for three years, starting in spring, 2020. Spin Master announced this news in a press release on December 21, but since they used the term “boys action catagory” instead of “action figures” nobody noticed or knew what they were talking about until Bloomberg figured it out and broke the news on Christmas Eve, which sent Mattel’s stock on a downward spiral going into the holiday. It was bit of a ridiculous reaction when you consider that Mattel will still be making and selling DC action figures for the next year, so any earnings estimates for 2019 shouldn’t be affected at all. Mattel will still benefit from selling toys based on Aquaman, the highest-grossing film released this holiday season as well as the upcoming, kid-friendly Shazam movie. . 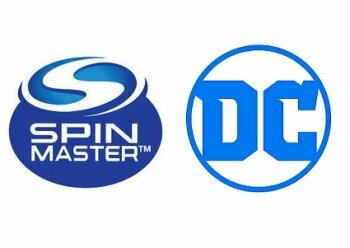 Specifically, Spin Master announced, “Beginning Spring 2020, Spin Master will be a new toy licensee for DC in the boy’s action category, remote control and robotic vehicles, water toys and games and puzzles.” Spin Master had previously made and sold several remote control, Tech Deck and other DC Comics-based toys (like the one seen at left), so it’s not like they didn’t already have a working relationship with DC. What we don’t know yet is how aggressively Mattel tried to keep the DC action figure license, if at all. Mattel has retained the rights to girls toys, including DC Superhero Girls, which is a line many people thought Mattel really dropped the ball with this year, and there is one school of thought that Mattel may have let the DC action figures go for a specific reason, which I will get into later in this post. 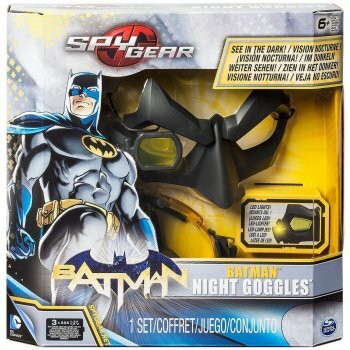 Mattel also retained the DC Comics pre-school license, which includes the very lucrative Imaginext line. Spin Master is one of the rising stars of the toy industry, growing exponentially through recent acquistions and is managed probably better than any other toy company of that size, they will add the DC portfolio of toys to their already successful brands that include Air Hogs, Paw Patrol, Meccano, Zoomer, Hatchimals, Gund, Teck Deck and about a zillion other toys. One area that Spin Master has been weak in has been action figures, but with Hasbro recently laying off some of the brightest talents in action figure design and line management, Spin Master could very easily assemble a top-notch team and have a great product launch in 2020. Previously Spin Master has released action figures based on Tron and The Last Airbender, and has shown that they can handle design and distribution of 6″ and 3 3/4″ figures. This does not look great for Mattel, but like I said, we still don’t know how hard Mattel tried to retain their deal for DC action figures. My theory is that Mattel deliberately gave up the line to make a potential merger with Hasbro more likely. One of the possible regulatory hurdles to such a merger would have been that if Mattel controlled DC Comics action figures, while Hasbro controlled Marvel’s, and that the merged company would have a virtual monopoly on the superhero action figure market. Mattel seems to be trying to slim down a bit to make a merger or acquisition possible. They seem to have cut way back on Matchbox in favor of their Hot Wheels line, and in fashion dolls, Mattel has seemingly pulled the plug on any of their own products that could eat into Barbie’s market share. Hot Wheels and Barbie both saw their market share increase this year, and that was a much-ballyhooed point in Mattel’s third quarter reports. What was not ballyhooed even a little was that Barbie’s market share was up, but Mattel had completely killed Ever After High and Monster High, and barely shipped any new product for the DC Superhero Girls and WWE Action Dolls in 2018. DC Superhero Girls was a billion-dollar brand its first two years in existence, and now, two years after that high mark, the only evidence that it’s still around is the fact that Mattel retained the rights to the cartoon series that’s coming to Cartoon Network next year. 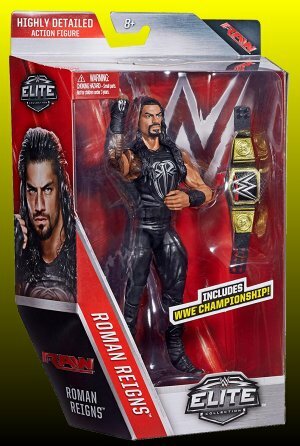 The first series of WWE Action Dolls sold in decent numbers, but the second series seems to be exclusive to Amazon, who didn’t do much to promote that they had them. It seems to me that Mattel is streamlining to make themselves more attractive and less complicated to any potential buyer. 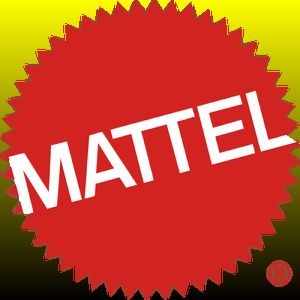 The name “Mattel” is somewhat tainted in the industry due to years of mismanagement, but Barbie and Hot Wheels are still two evergreen cash cow brands, and that seems to be what Mattel wants their defining brands to be. There are those who disagree with that idea. An analyst at Goldman Sachs says that he expects Mattel to aggressively pursue the Marvel and Star Wars action figure licenses that Hasbro currently holds. I think he’s sort of nuts if he thinks they have a chance, but that doesn’t mean that Mattel isn’t nuts as well. The fact is that Mattel has badly botched their DC action figure lines, killing and relaunching them every two years, regardless of whether or not they’re selling, and not bothering to distribute them to the most compatible retailers. That might not be Mattel’s fault. Warner Brothers Consumer Products might have been pulling the strings, and this entire DC licence situation could just be that Mattel was sick of dealing with them. WBCP is infamous for calling all the shots on toy lines and related cartoon shows, and then pulling the plug on them prematurely. It’s why Cartoon Network, which is a sister company under the Warners umbrella, is reluctant to run new DC Comics-based cartoons. Based on their handling of DC’s figures, and the success that Hasbro has had with Marvel of late, I don’t see even a remote chance that Mattel could get Star Wars or Marvel. Hasbro’s Star Wars toys are in a major slump, but it’s a slump that corresponds directly to the performance of the recent movies. I don’t think Hasbro will be blamed for that. Mattel is going gangbusters with WWE action figures (seen left), which are currently the best-selling action figure line in the country, and holding that license may make them more attractive to a potential buyer as well. And keep in mind that the theory that Mattel is trying to position themselves for a merger or acquisition is just my guess at the moment. This could just be a case of Spin Master outbidding Mattel for the DC action figure license. For the collector, this is the “interesting times” of the famous Chinese curse. Will Mattel release all of their previously-announced product before their deal ends? Will Spin Master hire new designers who know how to create great figures? Will Spin Master make their figures compatible with the old Mattel figures, or will they make them in all-new sizes? 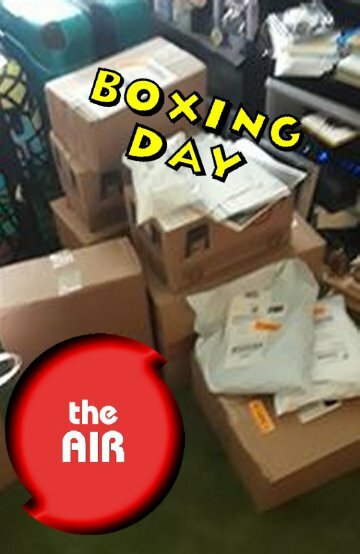 BOXING DAY On The AIR! Highlights of Wednesday’s programming include Christmas episodes of Curtain Call at 9:30 AM, The Bats**it Crazy Show at 10:30 AM, Beatles Blast at Noon, Sydney’s Big Electric Cat at 1 PM, Prognosis at 3 PM, Radio Free Charleston at 5 PM and The Swing Shift at 7 PM. Holiday music continues until Midnight, when we resume our regular schedule with the weekly overnight marathon of Mel Larch’s round up of great musical theater on Curtain Call. In the new year we will be beefing up our overnight marathon schedule, so that you can binge-listen to your favorite shows on The AIR. The new year will bring some big changes to the entire programming schedule on The AIR, as some of our long-running shows go on hiatus, and we bring in some new programming ideas along with a more predictable replay schedule for our most popular music shows. Keep checking PopCult for details, because you won’t want to miss it. Merry Christmas, Happy Holidays and whatever good tidings fill your bill from PopCult and the Larch-Panucci household. 2018 has been one of the most challenging years of recent memory, but I hope that everybody can find some peace and well-being on this special day, even the scary guy in the big house. We are hoping to bring you a special post-Christmas treat sometime this week, so if you have time, keep checking PopCult. As is our tradition on Christmas Day, we bring you Melanie Larch singing “Ave Maria” from the very first Christmas episode of Radio Free Charleston. This holiday week we get things started with a new digital painting, inspired by a years-ago trip to Snowshoe Mountain Resort in Pochontas County. 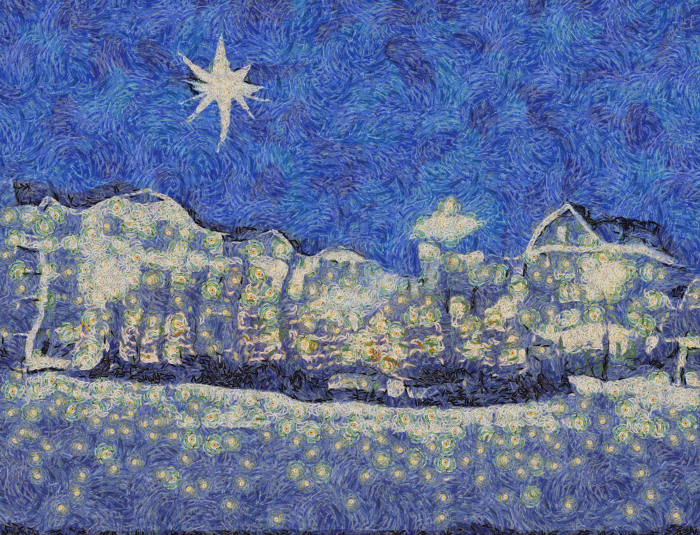 You can probably detect a little inspiration from Vincent Van Gogh here, as well. Basically I wanted to see what it might look like if the sky was dark, save for one star, but the stuff on the ground was illuminated by hundreds of lights. I sorta like it, so it works for a Christmas Eve edition of Monday Morning Art. If you sorta like it, you can click on the image to see a larger version. Tonight we bring you a collection of Christmas-themed short films that are, shall we say, “less traditional” than those you might normally watch to get into the holiday spirit. Some of these you may have seen before here in PopCult, while some are new to our readers. These are our olive branch to those of us who have more of a “Bah, Humbug” attitude toward the holiday. This week depart from our normal chronological presentation of classic episodes of Radio Free Charleston to zip back just one day short of five years to a programming stunt I pulled here in PopCult. 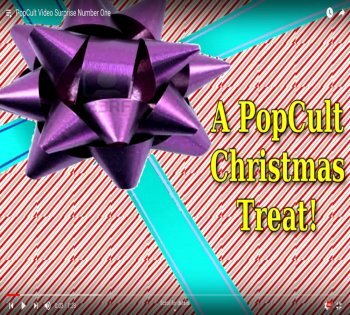 On December 23, 2013, Every hour, for ten hours, I posted a “PopCult Christmas Treat.” These were videos that ranged from less than a minute, to six and a half minutes long (with most on the short side) and they contained various bits of cool stuff left over, or newly-recorded, from the Radio Free Charleston Archives. You will find among these ten clips full songs by The Laser Beams, Radio Cult and the trio of Sasha Collette, John Lilly and Jonathan Wood, plus some short films and vintage animation from Frank Panucci, vintage toy commericals and a few repurposed interstitials from the show. As an experiment in blogging, it was a failure. A couple of the clips have been watched a few hundred times, but others rank among my least-watched YouTube clips ever. The thing is, when you combine all of these Christmas Treats together, as we have done here today with the embedded playlist, they meld together like an ersatz episode of Radio Free Charleston, minus the host segments. The total package is just about the same length, too. That’s why we bring them to you today, in the holiday spirit of weirdness and randomosity, and in the realization that, since hardly anybody watched them the first time, they’d seem BRAND-NEW to most of our readers!